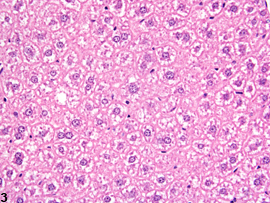 Glycogen accumulation-normal accumulation in hepatocytes in a female B6C3F1 mouse from a chronic study. Glycogen accumulation-normal mobilization of glycogen from centrilobular area in a male B6C3F1 mouse from a subchronic study. 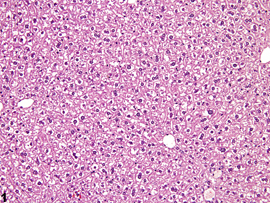 Glycogen accumulation-glycogen in all hepatocytes in a male B6C3F1 mouse from a subchronic study. Glycogen depletion in a female B6C3F1 mouse from a subchronic study. Because rodents typically feed at night, the degree of glycogen accumulation within hepatocytes is typically highest in the early morning hours and wanes throughout the day. 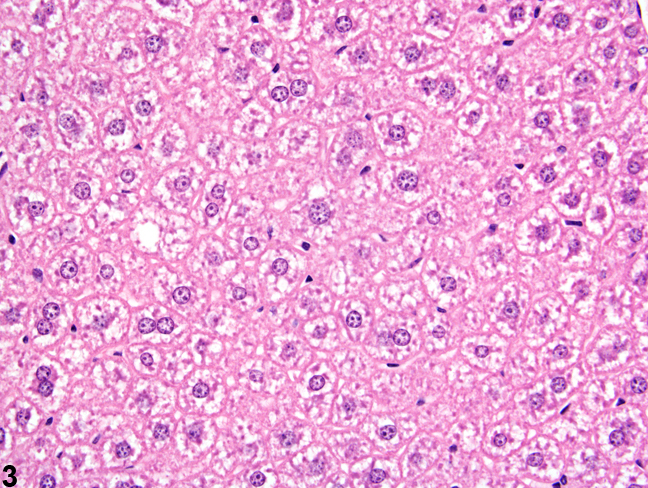 It also typically involves all hepatocytes in each lobule ( Figure 1 and Figure 3 ). 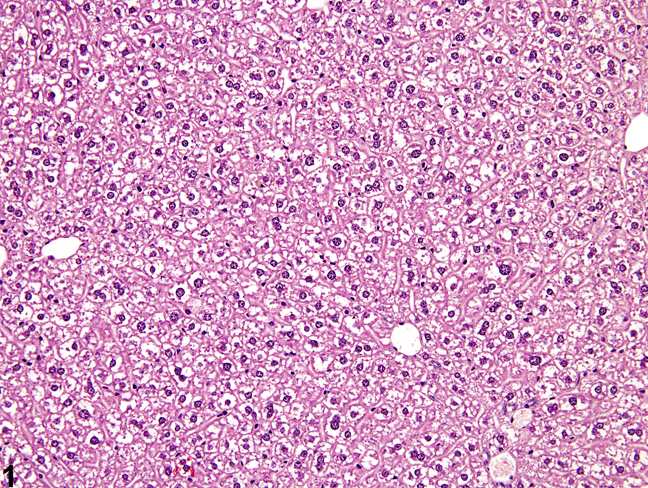 It initially disappears in the centrilobular hepatocytes ( Figure 2 ), with progression to the periportal hepatocytes during the day. Consequently, comparisons among animals should take the time of necropsy into consideration. Figure 4 is from a treated mouse (from the same study as Figure 3 ) that was necropsied in the early morning. 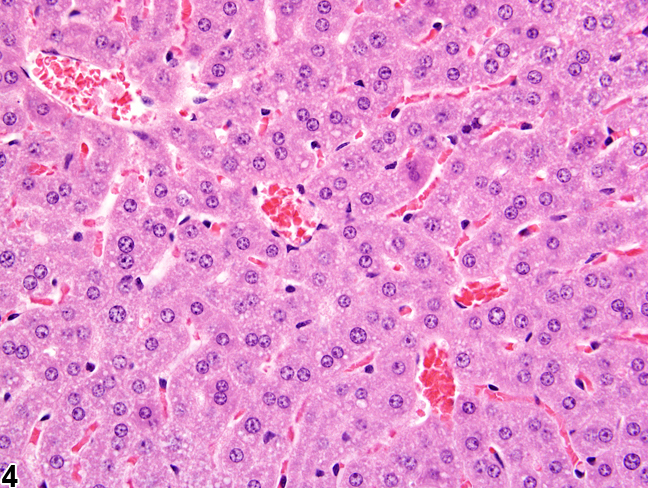 There is a notable depletion of glycogen within hepatocytes. Excess glycogen accumulation beyond that present in Figure 1 and Figure 3 may also occur. 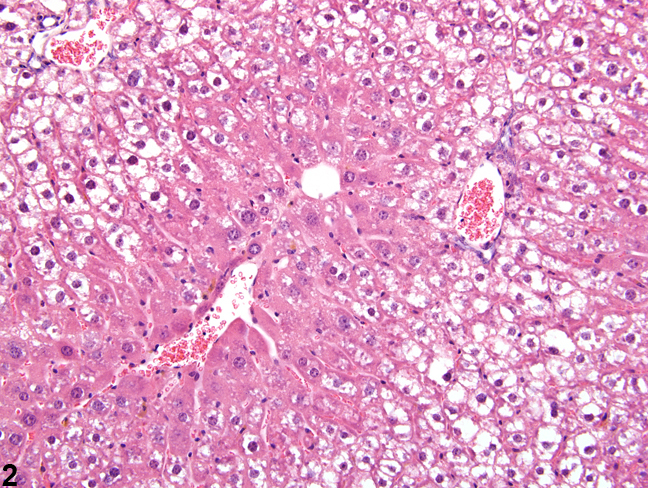 The morphologic appearance of glycogen in hepatocytes is distinctive, allowing glycogen accumulation or depletion to be readily diagnosed in most cases. However, appropriate fixation and definitive special staining are necessary for unequivocal evidence of glycogen deposition. In some cases, particularly when differences in the amount of glycogen are accompanied by other cytoplasmic changes, glycogen accumulation or depletion may not be easily discerned. In the absence of any treatment-related changes within a study, the degrees of glycogen demonstrated in Figure 1 , Figure 2 , and Figure 3 are considered background (spontaneous) changes and should not be diagnosed. If, in contrast to the control animals, there is a treatment-related increase in glycogen in the hepatocytes, glycogen accumulation should be diagnosed in the treated animals and assigned a severity grade. Likewise, if there is a treatment-related glycogen depletion (as in Figure 4 vs. Figure Figure 3 ), glycogen depletion should be diagnosed in the treated animals and given a severity grade. In the context of a toxicity study, some treated animals may have a depressed appetite and will have decreased amounts of glycogen in the liver, in contrast to the concurrent controls. Consequently, interpretation of glycogen depletion should take food consumption and general animal health into consideration. 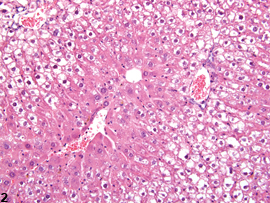 Changes in the amount of hepatocellular glycogen are frequently accompanied by other cytoplasmic alterations, such as fatty change or cytoplasmic vacuolization, and alterations in glycogen content can be difficult to distinguish from the accompanying changes. 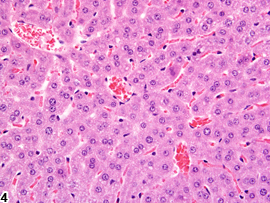 In those situations, a diagnosis of hepatocyte cytoplasmic vacuolization is appropriate, along with a severity grade, but the morphology of the cytoplasmic changes in the hepatocytes should be thoroughly described in the pathology narrative. The pathology narrative should also include the pathologist’s opinions regarding the contents of the cytoplasmic vacuoles. Cattley RC, Popp JA. 2002. Liver. In: Handbook of Toxicologic Pathology (Haschek WM, Rousseaux CG, Wallig MA, eds). Academic Press, San Diego, 2:187-225.